Summer is here and what’s a better way to welcome the season of fun with delicious, chilled desserts and drinks. 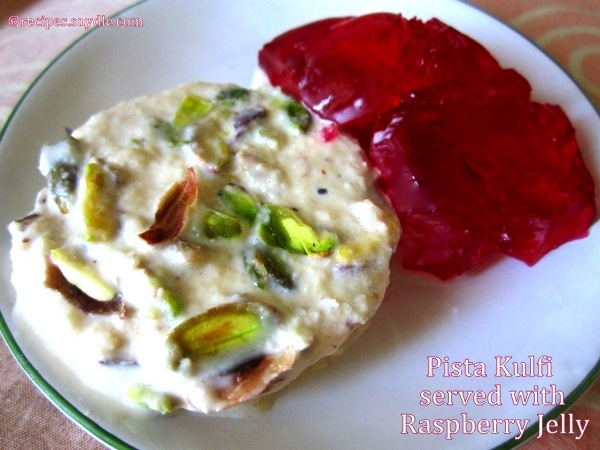 Today’s recipe is pista kulfi / pistachio kulfi. Kulfi is an Indian ice-cream, which is like egg-less ice-cream. It is made from milk by reducing it. Something to thicken up the milk is also used; milk powder or cornflour. I added some unsweetened khoya because it yields a richer and creamier kulfi. Khoya is also known as mawa. It is evaporated milk and you can buy it from a sweets shop. Some condensed milk will help emulsify he kulfi mixture and reduce the odds of formation f ice within the kulfi. To add some flavor, I added pistachios and cardamom. Saffron gives a nice color to the kulfi. If you want the nice texture of malai kulfi recipe, use full fat milk. This kulfi is delicious, fragrant and looks great too. 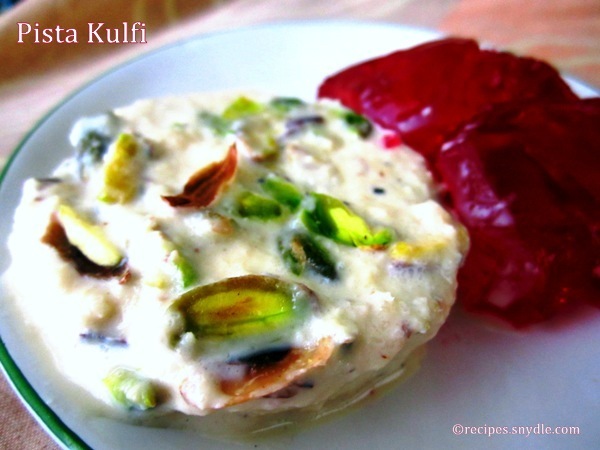 You have it as is or you can make falooda with this kulfi. At my place, it is usually served with raspberry jell-o. But it’s entirely up to you how you serve your kulfi. Once prepared, you can store it for about 3 to 4 days, provided there is any left! The aluminum or plastic kulfi moulds are easily available in the market. You can find them in utensils shop. I did not use kulfi moulds this time. I wanted a change, so I froze the kulfi mixture in wide steel bowls for a flat disc-like shape. Let’s get started with the recipe of kulfi. For the purpose of measurement, 1 cup = 250 ml. This recipe yields about 5 to 6 kulfis, depending on the size of the mould. Mash the khoya well. Also, grind 100 grams of the pistachios to a coarse powder. The rest 25 grams shall be used to garnish the kulfi. Chop them into small pieces. Keep aside. In a wide non-stick pan, take milk. Heat the milk on medium flame while stirring it. When it comes to a boil, lower the flame and allow the milk to simmer for about 40 minutes so that it gets thickened and reduced. Keep stirring the milk and scraping the sides of the pan. The milk will have reduced to about 800 ml by now. At this point, add in the cornstarch dissolved in some milk. Stir and allow it to simmer for 2-3 minutes. The milk will thicken. Add in the sugar to taste, coarsely ground pistachios, cardamom powder and mawa / khoya. Mix well and cook for 2 minutes till the mawa melts and sugar dissolves in the milk. Finish with kesar and condensed milk. Mix well. Switch off the flame after a minute and allow the mixture to cool to room temperature. The mixture will have thickened up a lot by now, like rabdi, creamy and barely pourable. Fill the mixture in the kulfi moulds and garnish them with the remaining chopped pistachios. Pack the mould well and place them in the freezer. The kulfi will take 6 to 7 hours to freeze well. If freezing the kulfis in a bowl like I did, cover it well with cling film or aluminum foil. When you want to serve the kulfis, just place the kulfi moulds under running water for 5-6 seconds. Open the lid and push in an ice-cream stick in the center and pull the kulfi out. Alternatively, scoop out the kulfi with the help of a knife into a plate. Serve as is or with jelly or falooda. Enjoy!